The Fog of War (2003) – Movie Review – Another Movie Blog! The very first lesson of The Fog of War, the documentary which finally nabbed legend Errol Morris his first Oscar, is to empathise with your enemy. 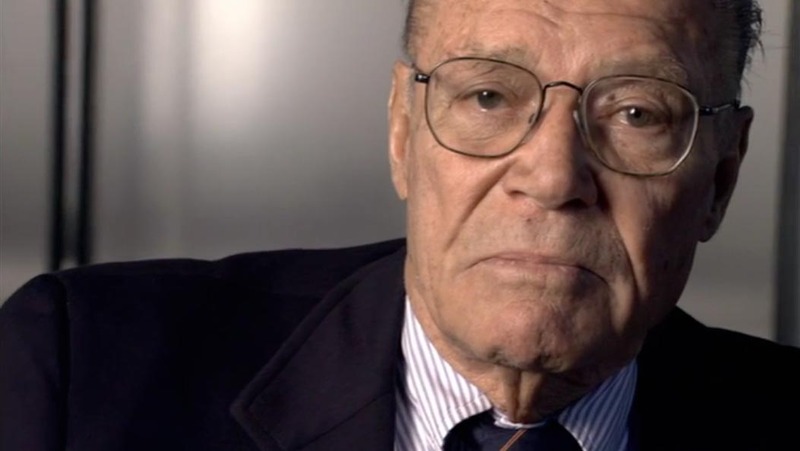 For many who lived during Vietnam that lesson could be taken towards Robert McNamara himself, the controversial Secretary of Defence during the Vietnam War, seen as many as the key architect of that conflict. He is also a key architect of this documentary, the narrative and the imagery matching with the story of his life and work, leaping from multiple jobs, life events and wars at a whim as he tells them. The camera is so close to McNamara’s face at points that you can see the fillings in his teeth. It makes you even more aware of the mouth that is telling the tale, and with the camera front and centre his perspective is made all the more obvious. Many times he is proud at his life, his accomplishes in war, family and beyond. Occasionally there’s a feel he is holding something back (the parallels between Vietnam and Iraq avoided by McNamara, but the lesson Be prepared to reexamine your reasoning definitely making one think of WMD’s). But through his obvious guilt comes clarity and honesty. From his role in the bombing of 100,000 in Tokyo during WW2, to thinking of how many action in Vietnam can’t be seen as Just War. Then what constitutes Just War in the first place, in a moment and environment so intense and ridiculous and inevitable as war. He is certainly more revealing and giving than Donald Rumsfeld in Morris’ follow up film The Unknown Known. By comparison, the “fog of war” presented here is much more clear. Errol Morris is far away in their interview, away from the camera and on occasion shouting across the room. But in the film The Fog of War he could not be closer. Visual metaphors continue falling, from dominoes to skulls to numbers themselves, the jump cuts in McNamara’s speech hitting as hard as the questions. As he continues cutting from the maps of war sites to the cities which those maps represent, we get a better sense of the crowds, and what we can see through the merging of images. The overlays are of the dead, and of a much less alive living. The movie may be called The Fog of War, but from the first montage to the last we get a grasp of the machinery of war. The frames and editing punching into numbers, the repetition of combat, a cavalcade of technology as small as tape recorders and as significant as the atomic bomb. Like Philip Glass’ incredible score, the repetition and the bombast is the act of war, an act that once it has started is so above human understanding that it is hard not to marvel at it. It is, in the most perverse and devastating way, a beautiful art. One that results in misery. The 11 rules of The Fog of War go from trying to know your enemy to not understanding humanity; You can’t change human nature. One could see that as a contradiction but through Morris and through McNamara we see how both those statements can be true. Knowledge is power. Especially the knowledge of war, and that it continues to be inescapable.